Former Liverpool captain Ronnie Whelan expects more "twists and turns" in the Premier League title race. The Reds will become champions if they win their last four games but dropped points could benefit either Chelsea or Manchester City. "I don't think anyone can call it at this moment," Whelan, a member of Liverpool's last title-winning side in 1990, told BBC Radio 5 live. 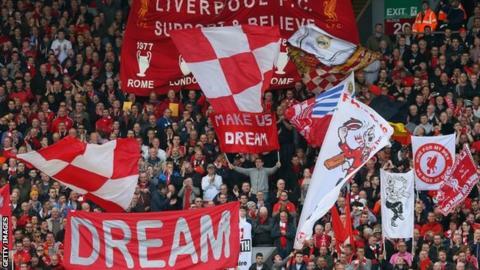 "There is still so much to happen, but it is in Liverpool's hands." Liverpool's 3-2 victory over Manchester City on Sunday kept them two points clear of second-placed Chelsea, who are still to visit Anfield. City are a further five points adrift with two games in hand. Asked if the City match was a title decider, Whelan, who scored 73 goals in 493 appearances for Liverpool between 1979 and 1994. said: "No, far from it. There is still a little way to go and they have to concentrate so hard to get to the finish line." Liverpool's next challenge is an away trip to Norwich, who are only two points above the relegation zone and recently replaced manager Chris Hughton with youth coach Neil Adams. Although much of the focus is already turning to Chelsea's visit to Anfield the following weekend, Whelan is wary of the trip to Carrow Road. "It is very easy to get wrapped up in all this talk of winning the league, but they have to go to Norwich to win," said the former Republic of Ireland international. "They have a new manager. They are fighting relegation so it is not going to be easy." Liverpool skipper Steven Gerrard says he will approach the game with Norwich in just the same way as he approached the 2005 Champions League final against AC Milan. "We have to forget what colour their kit is and the personnel wearing it and treat them as the best players in the world," he said. "We have to forget where we are and forget what we've done. We have to prepare for Norwich like it's the last game of our careers." Whelan said their chances of capturing their elusive 19th title could hinge on the continuing form of Gerrard, who has been rejuvenated by a deep-lying role in front of the back four. "Gerrard played in this role a few years ago and didn't want to do it," said Whelan. "Now he is older and wiser. Now he is the boss. He tells people where to go. He is vital. He is a bit like a quarterback. He keeps everything ticking over. He has to stay in that position." Liverpool will be without ever-present midfielder Jordan Henderson until the final match of the season after he was sent off for a late tackle on City midfieder Samir Nasri and banned for three matches. But Whelan believes the Reds, who have won their last 10 league games and scored 93 goals so far this season, have sufficient cover to cope without the England international. "He has been brilliant and will be missed but luckily you have Joe Allen and you have Lucas coming back from injury," said Whelan. "They can fill in that role and they will probably do it just as well as Jordan."